I’d been wanting a GPS device for a year or so when my husband gave me one for my birthday. 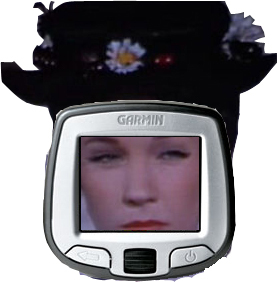 It was a Garmin StreetPilot i5. Everyone agreed this was a perfect gift for me because of my knack for getting lost. We tried it out immediately. We discovered that we didn’t like the American female voice – it was flat and nasally obnoxious, so we switched to the British female voice and declared her official Voice of the Camry. She was authoritative in a humble way. We named her Millicent. Millicent was our heroine. She got us home when we were lost and got us to far away destinations when we were unsure of how to get there. We envisioned a woman sitting in our personal satellite watching over us and keeping us safe. Last August, close to our first anniversary with Millicent, she — along with her power cord and dashboard mount, went missing from our car. We suspected foul play and were worried that her thieves would treat her poorly. We envisioned her, blindfolded and gagged in the trunk of their car, along with other stolen items. We knew that if allowed to talk she would say “Re-callllll-cu-lating” at some point, and that might be her undoing. Thieves don’t like to be talked back to. Of course, it is possible that Millicent simply decided that our family no longer needed her — especially since her advice was often shunned. She may simply have used her dashboard mount in an umbrella like fashion and floated away like a miniature electronic Mary Poppins. Up next: Our new GPS device: Bruce — aka Steve — aka Ken.